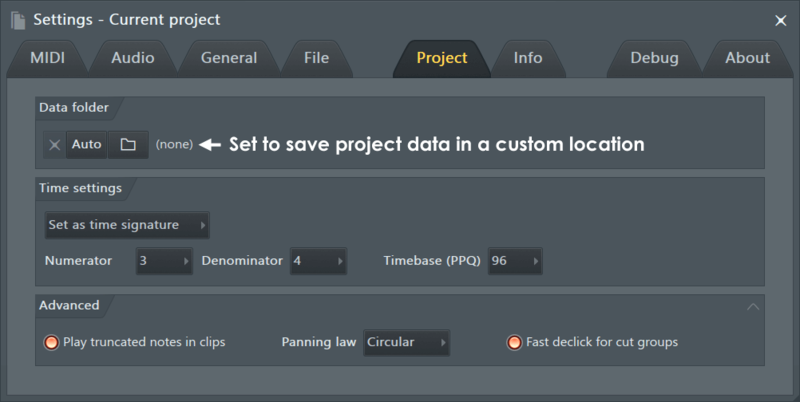 The Project General Settings page contains general options for each project, stored locally in each file. NOTE: If the project settings icons are not visible in the side bar on left of the screen, click the Project button to expand the section. A custom save location for the current project can be set here. It is useful to keep all the data created with the project in one location. The data types saved include the project file (.flp/.zip), audio to disk recordings and dragged sample data (drag and drop edits from Edison, Slicex & Channel samplers). Any samples you add to the project from the Browser or other locations will remain where they are, use the .zip format project save to include them in this folder. Folder icon - Opens a browser window to allow a custom project save location to be set. Clear - Clears the custom save location. Auto - Sets the save location to the same folder the project was loaded from. Note: The default save locations for various data-types are discussed here. Use these controls to adjust the project Time Signature and event resolution (PPQ). Set as time division - This is the grid system used prior to the introduction of Time Signatures (see below). NOTE: If a Time Signature is used in the project, this option will not be available (greyed out). If you want to go from Time Signatures back to Time Divisions, you will need to remove all Time Signature markers in the project (Playlist and Patterns). Bar - The number of beats per bar. NOTE: Although this is a global project setting you can change the Pattern Length on the Channel Rack to set a custom number of beats per bar for each pattern. Just drag the Channel Rack to the right where indicated. Beat - The number of steps per beat. Set as time signature - Use this mode to set traditional Time Signatures. For more information on working with Time Signatures see the relevant sections in the Playlist & Piano roll. NOTE: You can set multiple Time Signatures in a Project using Piano roll and Playlist Time Markers (Shift+Alt+T). Numerator - Beats per bar (measure). Timebase (PPQ) - Sets the event resolution for the current project in Pulses Per Quarter-note (PPQ). In other words, how finely the time-line of the project is represented and so notes/clips/events placed on that time-line. The default setting is 96 with higher PPQ allowing finer control but it also uses more CPU. The Playlist maximum zoom is limited by the PPQ settings, if you need to zoom Audio Clips to a higher level, increase the PPQ setting. The Playlist and Clip placement only zooms to the maximum level supported by the underlying PPQ. NOTE: Adjusting PPQ to a lower level mid-project, will alter the placement of notes and clips if these events fall between the new PPQ grid. Increasing PPQ mid-project won't affect event placement. NOTE: The number of Beats per Bar define the overall pulse or natural rhythm of music. For example 'waltz' music is generally 3 beats per bar (1,2,3,1,2,3...) with a rhythmic emphasis on the 1 beat. Most 'pop' music is 4 beats per bar (1,2,3,4,1,2,3,4...) with an emphasis on the 1 also. However due to the different number of beats in each bar there is a distinctly different rhythmic pulse to each meter (3/4 or 5/8). More on time signatures and musical theory, of which you have been lured into a discussion of, here. There's also a discussion of the term 'beat' here to clarify confusion caused by its recent misuse on the interwebs. Play truncated notes in clips - Restores notes that span a slice point in Pattern Clips. With this option off, the tail of the note is dropped from the second half of the sliced Clip. NOTE: This can cause projects to sound wrong when used on projects with this option off OR made prior to the introduction of the feature (FL Studio 10.5). 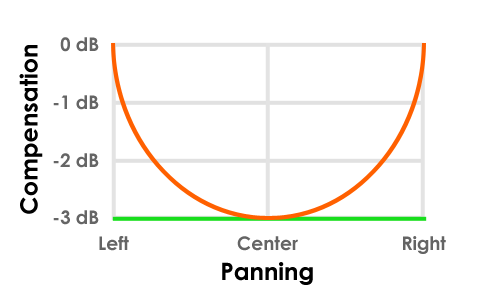 Panning law - The purpose is to maintain a constant apparent volume as a sound is panned. For example, if a sound is panned hard left or right, only one speaker will be active. This will sound quieter than the center position where both speakers are active, unless steps are taken to counteract this effect. Circular panning maintains a constant apparent volume by progressively lowering the combined volume of the L+R channels by -3dB as the pan passes dead center. Triangular panning does not apply this compensation, so the apparent loudness will increase as the sound passes the center position. There are a number of panning compensation methods used by various manufacturers, collectively they are referred to as Panning laws. Circular - Level compensation is applied when panning (orange). NOTES: Don't fret over what panning law is or isn't used. When you mix a song, the relative pan positions and volumes are adjusted according to what you wanted to hear. In other words, you made the mix, you made it how you wanted it to sound (hopefully). So, a mix is a mix! Panning law is only a concern when sharing projects to make sure both installations are using the same settings. Changing the panning law after a project is mixed will change relative volumes and apparent stereo locations and so the mix (bad idea). If you are sharing track stems (audio from individual mixer tracks) then the panning law used by the project is 'rendered' into each stereo track, so is not a factor to worry about.